Athena Cat Goddess Wise Kitty: Cute Cat Products: Get your Cute Cat Cup, Kitty Flower Pot and Kitty Cat Cup Here! Purrfect Gifts! Cute Cat Products: Get your Cute Cat Cup, Kitty Flower Pot and Kitty Cat Cup Here! Purrfect Gifts! Take a look at these unbelievably cute cat products. 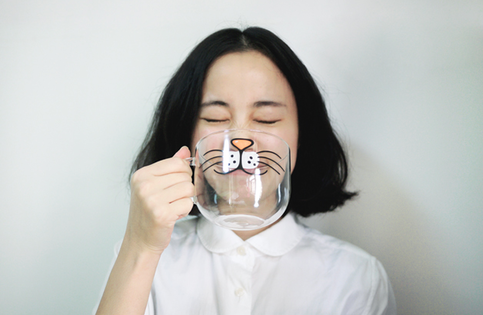 Brighten up your day and beat those morning blues with these cute and quirky cartoon cat mugs. We think they make a terrific gift for any cat lover! Made from Boronsilicate glass, these fun mugs are microwave and oven safe and can withstand up to 120 degrees of temperature change. Or how about this gorgeous Black and White Cat Cup? Rather sweet, don't you think? It's sure to brighten up any day and make that coffee or tea break that extra special and fun. 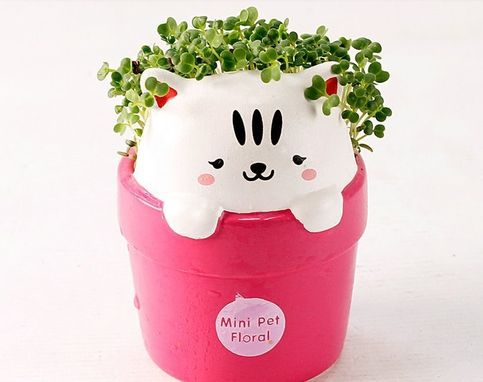 This adorable flower pot makes the purrfect gift and will look great on any desk or as a room decoration. Seeds are included and comes in four pretty colours. Choose from pink, purple, yellow and blue. Only $14.00 + plus FREE international shipping. Labels: cat lovers, cat products, cat-themed gifts, gifts for cat lovers. Oh! These are very cute! Very cute! We love the cartoon mug! Okay, now those really are cute!